Mammootty is the mega superstar of Malayalam cinema. He is considered as one of the most talented actors of Indian film industry. He was born in September 1953 at Chempu near Vaikom in Kottayam district. Mammootty is a lawyer by profession, but he had his interests in acting. Mammootty entered the film field rather late. His first film was Devalokam by M.T. Vasudevan Nair. The film was not completed. His another mentor K.G. George made him into a bankable superstar. K G George films like Yavanika, Valarthumrigangal and Vilkanunde Swapnangal made him noticeable. Mammotty had many ups and lows in his film career. He became a superstar after the success of the film New Delhi, directed by Joshi. Mammooty has acted in many commercial films and Parallel cinema. The film Oru CBI Diary Kurippu, in which Mammootty was portrayed a Sethurama Iyer, a CBI Officer, was a mega hit of 1988. With the box office success of the film, 3 more films Jagratha(1989), Sethurama Iyer CBI(2004) and Nerariyan CBI(2005) casting Mammootty as Sethurama Iyer were released and all of them were well received by Keralaites. Other popular films casting Mammootty as the hero are Thrishna, Padayottam, Thadakom, Komaran, John Jaffer Janardhanan, Amrutha Geetham, Aa Divasom, Sesham Kazhchayil, Sagaram Santham, Mela, Prathigna, Oru Madapravinte Katha, Lekhayude Marnam: Oru Flashback, Koodevide?, Guru Dakshina, America America, Aa Rathri, Sandhyakenthinu Sindooram, Mangalam Nerunnu, Edavelakku Sesham, Chakkarayumma, Athirathram, Aksharangal, Adiyozhukkukal, Thinkalazhcha Nalla Divasam, Oduvil Kittiya Vartha, Katha Ithu Vare, Yathra, Kathodu Kathoram, Vartha, Aavanazhi, Sayam Sandhya, Rakkuyilin Rajassadasil, Thaniyavartanam, Manu Uncle, Vicharana, August 1, Abkari, Thanthram, Adikkurippu and many more. His other notable performances came in the films Inspector Balram, Amaram, Nair Saab, Kauravar, Johnnie Walker, Kizhakkan Pathrose, Aayirappara, Jackpot, Sainyam, No: 1 Sneha Theeram Bangalore North, Railway Coolie, Soorya Manasam, Pappayude Swantham Appoos, Dhruvam, Vatsalyam, Vidheyan, Ponthan Mada, Sukrutham, The King, The Truth, Hitler, Bhoothakannadi, Harikrishnans, Udyanapalakan, Thachiledathu Chundan, Stalin Sivadas, Pallavur Devanarayanan, Megham, The Godman, Ezhupunna Tharakan, Valliettan, Dada Sahib, Rakshasa Rajavu, Dubai, Dr. Babasaheb Ambedkar, Kaazhcha, Phantom, Chronic Bachelor, Pattalam, Raapakal, and Black. His recent releases include Thommanum Makkalum, Thaskara Veeran, Nerariyan CBI, Rajamanikyam, Bus Conductor, Balram vs. Tharadas, Thuruppu Gulan and Prajapathy. 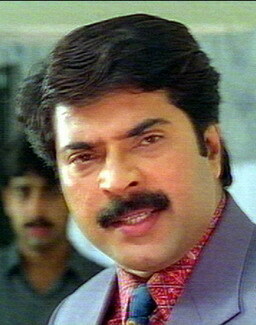 Mammootty crossed the boundaries of Malayalam to act in Hindi, Tamil and Telugu movies. He proved successful in Tamil films like Dalapathi(acted along with Tamil superstar Rajnikant), Kandukondain Kandukondain, Marumalarchi, Arasiyal, Puthayal and Makkal Aatchi. His maiden Hindi film, Dhartiputra went unnoticed. But his national presence was once again felt after Jabbar Patel�s Dr Baba Saheb Ambedkar. M.T.Vasudevan Nair Movie Oru Vadakkan Verragatha(1989) and Adoor Gopalakrishnan film Mathilugal won him National Award for the best actor in 1989. He won the National award in the same category for two more times. For Vidheyan and Pothanmada in 1993 and Dr. Ambedkar in 1999. He bagged Kerala State Film Awards for a number of times. The film Ahimsa in 1981 won him the state award for the best supporting actor. Adiyozhukkukal (Best actor in 1984), Yathra and Nirakkoottu(Special Award in 1985), Oru Vadakkan Veeragadha and Mathilukal(Best Actor in 1989), Vidheyan and Pothanmada(Best Actor in 1994) and Kazhcha(Best Actor in 2004) are his other State Award winning films. Mammooty bagged many Filmfare Awards and Film Critics Awards for his excellent performances in a number of Malayalam films. He was awarded the PADMASREE in 1998, for his contributions to the Indian Cinema. He was honoured with V. Shantaram Award for the movie, Dr. Ambedkar. He also won various other awards like Asia Pacific Merlian Award, Cinema Express Awards, Ramu Karyat Award, Asianet Film Awards and Screen Award. Mammooty is married to Sulfaath and they have two children, a daughter, Surmi and a son, Dulquar Salman. He admires Indira Gandhi and Kamala Das. He dominated Malayalm cinema along with Mohanlal for the past 20-25 years. His acting talents along with his willingness to go to any extent to portray the roles offered to him, helped Mammootty to act both in Commericial films and Art films without any shortcomings. His voice is one of his major assets.